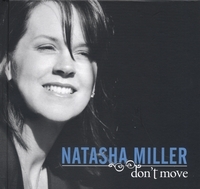 Once again, spunky vocalist Natasha Miller teams up with 81-year-old songwriter Bobby Sharp (Unchain My Heart, Don't Set Me Free), and this time, she’s got an album of destined-to-be jazz standards that outdoes everything she's produced to date. As she has in all her previous work, both live and recorded, Miller again demonstrates she can sing anything put in front of her (possibly even the phone book). Her voice harbors a rich palette of colors, sometimes sassy and insistent (“Don’t Set Me Free,” “Don’t Move”), sometimes sultry and ironic (”At Midnight,” “You Don’t Have to Learn How to Sing the Blues”), and sometimes wistful and longing, as in the haunting “Snow Covers the Valley,” with its hint of the tragic realities found in old Irish ballads. But even when she’s “A Prisoner of the Blues,” there’s no crying in her beer here. These are songs for grown-ups rendered by a 34-year-old artist who knows that even though fate may often deprive us from what we want, we keep on going anyway. What Natasha does is to bring these qualities together with finesse and power, delivering each song to the listener’s doorstep, where they don’t beg for entry, they come as familiar guests. Put all this together—vocal color, a tone that runs from hushed to fills-up-your-heart, a touch of attitude, range and power—with Natasha’s natural gift for just the right lyrical timing and you wonder how these songs could be sung any other way. As if that’s not enough, there’s the remarkable “sound” of the recording itself, due in large measure to the fact the album was produced at Skywalker Studios (George Lucas) in Northern California and engineered by the highly-respected Leslie Ann Jones. When you get that much talent under one roof, both in front of the mikes and behind the board, wonderful things happen. The group recorded all 11 tracks in a day and a half. Most were “down” on the first take. Natasha produced this—her fourth album—and is funding it through her independent record label Poignant Records based in the San Francisco Bay Area. Her previous release I Had a Feelin' (also a collection of Bobby Sharp tunes) was well received by jazz radio (charting in JazzWeek), and played by jazz programmers around the world. I Had a Feelin' has garnered local and national media attention and has sparked a movie production deal about Natasha and Mr. Sharp, as well. And the band? It includes all the West-Coast musical heavies—Los-Angeles-based pianist Josh Nelson, and from the Bay Area, John Shifflet/upright bass, Tim Bulkley/drums, Rob Roth/saxophone, Jeff Lewis/trumpet and flugelhorn, Adam Theis/trombone, Liz Prior Runnicles/viola, Emil Miland/cello, and Natasha/violin. Don't Move is a CD with a rich array of color and emotion, bringing another segment of Bobby Sharp's songbook to life. There’s music here for everyone—a little bit of the blue and the noir and a whole lot of up-tempo, foot-stompin’ surprises. There’s also the touching duet, “As the Years Come and Go,” sung by Miller and Sharp, a love song written by Sharp in younger years, now a testament by these two friends to their remarkable personal and musical partnership. Natasha is one of the Bay Area’s busiest performers and regularly sells out Yoshi's jazz club in Oakland. She made her Monterey Jazz Festival debut on Sept 18, 2005 with her 9-piece band to a standing-room- only audience who honored her with 2 standing ovations. I love this record. A brilliant pairing of two generations of talent. Stunningly recorded (thanks to Leslie Ann.) A wonderful addition to my collection.